The Aladdin MAXbrite 500 chimney was introduced in 2015 with the MAXbrite 500 burner. The chimney shape is designed to maximize the light output of the R-150 Lox-on Mantle. This chimney should always be used with a MAXbrite Model 500 burner to maximize light output and burning efficiency. First production was done with a green Aladdin MAXbrite logo fired on with later productions in white. 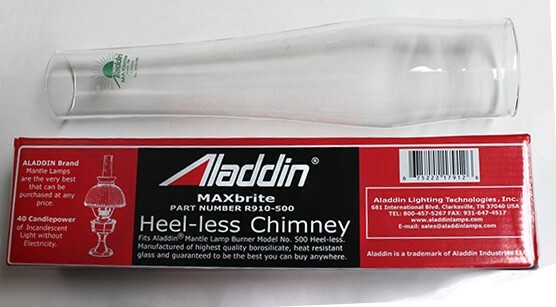 The Aladdin Lamps's R910-500 Heel-less Chimney is made of strong, laboratory grade clear borosilicate glass for lasting durability. The Aladdin MAXbrite Model 502 is a refinement of and replacement to the most recent Aladdin Model 23 side draft burner.